We’d love your help. Let us know what’s wrong with this preview of The Interlude by Lin Stepp. Too much work, too much pressure, and too much heartache can lead even a strong young woman like Mallory Wingate to the edge of a nervous breakdown. Now her doctor and employer have insisted she take a space to h In this gentle, inspirational romance, Lin Stepp reveals the healing touch and deep peace the beauty of the Smoky Mountains can bring to a hurt and troubled heart. To ask other readers questions about The Interlude, please sign up. THE INTERLUDE is part of the Smoky Mountain series by Lin Stepp. The twists and turns keep coming and I had to know how it was going to end! Every time I thought I knew where this story was going, a few pages later, Lin Stepp threw me for a loop and I knew I was wrong! I'm kicking myself for not reading this wonderful novel sooner. I'm on a mission now to read all of her books. They are just that good! THE INTERLUDE is a quick read and unputdownable! There were quite a few times when reading it that I wanted to reach into the pages and give Mallory And Lucas, but especially Lucas a good shake and tell them to open their eyes! I found myself laughing one second and then tearing up the next. If you are looking for a beautiful story to pull you out of your book slump, you can’t go wrong with THE INTERLUDE. Lin Stepp is now one of my auto buy authors. The twists and turns in THE INTERLUDE are going to keep you up late into the night trying to figure it out. One minute you believe you know where Mallory is going with her life and the next you are sitting there shaking your head, wondering what the heck just happened. I had my ideas, I had it all figured out, or so I thought, and BAM.......wrong again! Once you start reading, trust me, you aren't going to be able to stop! When everything is finally revealed, well, you won't believe it! THE INTERLUDE begins with Mallory Wingate returning home to her grandparents resort in the Smoky Mountains. She is beyond devastated as she has just buried her mother and her fiancé cheated on her and broke her heart. She's had a nervous breakdown and her employer tells her to go away and get better. So while she is on the plane she meets Lucas James and her life is turned totally upside down. I thoroughly enjoyed reading THE INTERLUDE. All of the characters are on their own spiritual journey, not just Mallory. It is heart warming and filled with so many different emotions. There is so much going on in this story, but Lin Stepp does a wonderful job of weaving all the pieces together. All of the characters will have you feeling sad and then giggling on the same page. More than once I wanted to be there with my new found friends! Once you finish devouring this story, you are going to want to tell everyone you know about this awesome book. Reading The Interlude was a bit out of the box for me, but it's good to try different types of books sometimes. Lin Steep has written a heart warming thoughtful story full of charm and idyllic everything. Yes, everything. The story is well written and paced, so I'm not referring to the writing style of the author, just the content. Serious mental health issues including bipolar disorder, suicide and mental breakdowns are addressed, and that is excellent. It's so important to shed more l Reading The Interlude was a bit out of the box for me, but it's good to try different types of books sometimes. Lin Steep has written a heart warming thoughtful story full of charm and idyllic everything. Yes, everything. The story is well written and paced, so I'm not referring to the writing style of the author, just the content. Serious mental health issues including bipolar disorder, suicide and mental breakdowns are addressed, and that is excellent. It's so important to shed more light on these conditions to remove the stigmas attached to them. The story shows how consequences resulting from these disorders affect family and friends in long term and short term ways. The importance of seeking treatment is also addressed. Another good aspect of the story is the subtle acknowledgement of the wisdom of children. One child in particular, Suzannah, age 5, says what she means, and it's basically the truth, even when the adults won't admit it. She is quite charming and wise. Remember, children know so much more than adults realize. One more good thing is the spirit of community. It's a wonderful thing to belong to a community or town or neighborhood that genuinely cares about your well being. Unfortunately, it's a phantom concept for many of us today. Things are a little too perfect. Feeling blue? Here's a hot guy just for you! Need a break from your stressful reality? Come stay at the grand parents resort where the gardens, in the southern heat, are perfection, we bake amazing things all day every day, and we take bad news like it's a gift. And, don't forget, one employee lives next door in a perfect little house within walking distance of his sister who effortlessly owns and operates a road side farm fresh stand while pregnant and with a small child in the southern heat. I have lived in the deep South my entire life, and this situation ain't happening without someone having a heat stroke. The final piece of perfection that is just not plausible is the way money magically appears when needed. In any amount. No worries. I realize this is supposed to be a feel good happy ever after story, and it delivers on that. It's the perfect type of escape read for the right reader. Fans of Lin Steep will not be disappointed. I'm probably too steeped in reality to completely love The Interlude. I'm in the slightly undecided area with a solid 4 🌟🌟🌟🌟 review. 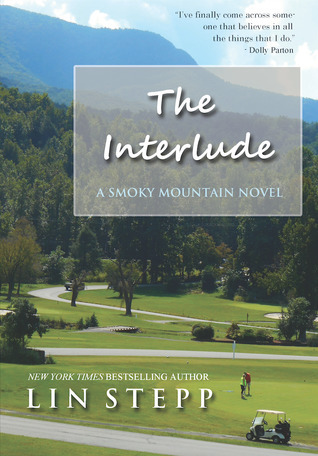 The Interlude by Lin Stepp is the most delightful contemporary Christian novel and part of the Smokey mountain series. I loved it. The Interlude is a book that you do not so much read as experience. I longed to jump inside its pages. With full descriptions Lin Stepp paints pictures of both landscape and characters enabling the reader to ‘walk’ through the novel. The characters were wonderfully drawn with realistic flaws and hang ups. They are warm and welcoming, opening their arms to encompass the The Interlude by Lin Stepp is the most delightful contemporary Christian novel and part of the Smokey mountain series. I loved it. The characters were wonderfully drawn with realistic flaws and hang ups. They are warm and welcoming, opening their arms to encompass the reader. We travel alongside them as their companion. Although there are the difficult themes of mental health and suicide, the book is not a gloomy read. The characters have a lighter side to them and have teasing interactions. Mental health issues range from mild to serious. It is always important to seek help and to surround yourself with people with love you and will support you. There is the theme of trusting God and not leaning on our own understanding. When life is tough we need to make sure our foundations are built on the word of God. If we look to ourselves we will wobble. We need to lean on God at all times. The church is not a social club where we network. It is a place of refuge where we press into God and where we support each other through life. Neither is the church a building. The church is the people and we carry God wherever we go. There is a delightful five year old girl in the tale. Her mannerisms and speech have been perfectly captured by Lin Stepp. She is a joy to behold. Within the novel there is something for everyone to enjoy. A cold case death rubs shoulders with modern day crimes to be solved. I always adore Lin Stepp’s novels. They entertain, inform and wrap me in love. I can guarantee that when the last page is read, I will be left smiling – and eagerly awaiting the next feel-good novel by Lin Stepp to hit the shelves. You are definitely missing out if you have not read a Lin Stepp novel. Remedy that and buy The Interlude today. Mirriam-Webster Dictionary defines the word interlude as "an intervening or interruptive period, space, or event," which is exactly what Mallory Wingate needed, and got, in more ways than she could've possibly imagined. After having a breakdown at work, and being admitted to the hospital, both her doctor and boss agree that Mallory needs a break, so Mallory heads back to the only place she's ever called home, her grandparents home, Millhouse Resort in the Smoky Mountains of Tennessee. On the flig Mirriam-Webster Dictionary defines the word interlude as "an intervening or interruptive period, space, or event," which is exactly what Mallory Wingate needed, and got, in more ways than she could've possibly imagined. After having a breakdown at work, and being admitted to the hospital, both her doctor and boss agree that Mallory needs a break, so Mallory heads back to the only place she's ever called home, her grandparents home, Millhouse Resort in the Smoky Mountains of Tennessee. On the flight there she meets ex-pro golfer Lucas James, and the two share an interlude that includes two flights, dinner, and a few passionate kisses to get Mallory's mind off her worries. Mallory and Lucas part ways knowing they'll never see each other again, but little do they know that this initial interlude is only the beginning. I fell in love with this book from the very beginning and kept falling in love with every chapter. In true Lin Stepp style, the imagery and great attention to detail is just incredible! How I wish I could visit the Millhouse Resort, sample Nonnie's confections at one of her teas, go hiking through the mountains and stop to put my feet in the stream, or even play a few rounds of golf. The whole resort came alive for me, which paired so well with each incredible character. Your heart hurts, feeling empathetic for for what each individual had to endure in the their lives. Lucas was the only person that had me growling in frustration as he unknowingly pushed his emotional issues onto others, creating drama that clearly could've been avoided had he realized sooner. There were times I wanted to reach through the pages and shake some sense into him! The ending was perfection and actually left me feeling sad that this interlude had to end for me as well. There is a great discussion guide in the back of the book for book clubs and reading groups, though I was sad that there weren't any of Nonnie's recipes included in the back as well, like there were in Claire in Edisto, which is surprising since food is a major theme throughout the book. The Interlude was a most enjoyable read with a wonderful story line and just enough conflict, amazing scenery, and a whole lotta love...and food. Okay, I have to admit I wasn't sure which book to read first so I started with The Interlude. It's a nice quaint setting with a good romantic story in it. But there is also a mystery and crimes. I didn't expect those to pop up in this book. Not sure that I expected anything more than a sweet romance story. M.T. also known as Mallory is a book editor who suffers a mental breakdown. Lucas is a widowed man with a daughter to raise. But he's no stranger to mental health issues due to his wife having had bipolar and taken her own life. He's sworn to protect his daughter and himself from ever experiencing that again. He's drawn to Mallory on the flight they share and still when he finds out she's his boss' grand daughter. But when he learns about her having had a mental "illness" he makes no bones of telling her they're not even going to try. I love that mental health issues are thrown in here. Too often people shy away from mental health thinking it's taboo. They're not and we really do need to get them out there more. Also I really liked how the author makes sure to let all know that mental breakdowns aren't considered a mental illness at all. Journey with Mallory and Lucas as they sort out life together. Will he open his heart? Can she overcome her own betrayal and heartbreak? What about who killed her father all those years ago? And who is the thief lurking in their midst? Great read and I highly recommend it! A chance meeting on a plane and a lively conversation is exactly what Mallory needs after the trauma and drama of the past several months. On her way to her grandparents’ home in the Smoky Mountains of Tennessee for some doctor-prescribed R&R, Mallory doesn’t expect to ever see Lucas again. Lin Stepp gives readers a wonderful mountain escape. From the gorgeous scenery to the resort crowds and busyness of Gatlinburg during the summer, I could picture it all. And then there’s the well-paced plo A chance meeting on a plane and a lively conversation is exactly what Mallory needs after the trauma and drama of the past several months. On her way to her grandparents’ home in the Smoky Mountains of Tennessee for some doctor-prescribed R&R, Mallory doesn’t expect to ever see Lucas again. Lin Stepp gives readers a wonderful mountain escape. From the gorgeous scenery to the resort crowds and busyness of Gatlinburg during the summer, I could picture it all. And then there’s the well-paced plot from the first meeting on the airplane to the perfect ending, Stepp hits every high note with memorable characters (especially five-year-old Suzannah), mysteries to unravel, a good balance of danger, romance, and internal conflict. If you’re looking for a bit of an escape within the pages of a book, you can’ be an interlude (see what I did there?) to the beautiful Smoky Mountains with a story that welcomes you to the family. The Interlude is a very different story from the other one I have read by Lin (Claire of Edisto), though no less beautiful. I enjoyed getting to know Mallory and Lucas, with their individual struggles and triumphs. There is also a fair bit of mystery with this story, which I always enjoy. The mysteries really kept the story moving forward! Lin is an excellent writer and I've enjoyed these two titles tremendously. I received this book from Just Read tours. This is my honest review and is in no way The Interlude is a very different story from the other one I have read by Lin (Claire of Edisto), though no less beautiful. I enjoyed getting to know Mallory and Lucas, with their individual struggles and triumphs. There is also a fair bit of mystery with this story, which I always enjoy. The mysteries really kept the story moving forward! Lin is an excellent writer and I've enjoyed these two titles tremendously. Highly recommend adding it to your TBR pile :) I love books set in places that ive been.